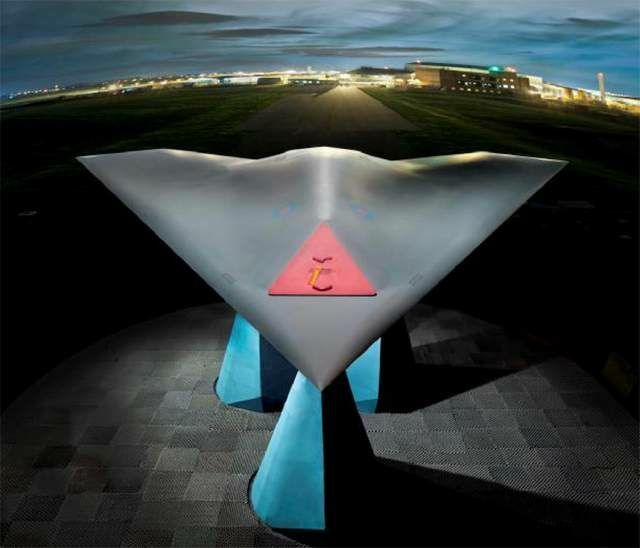 Some new information has emerged this week about future British drone programmes as BAE Systems held a media briefing at their Warton site to talk about their unmanned projects (our invitation was presumably lost in the post). Picture of Taranis at Warton, released by BAE Systems. According to the report by Defense News the first flight of BAE’s Taranis drone has been put back yet again until 2013. Originally due to make its maiden flight in 2011, it was first delayed until early 2012 for “technical and other reasons” but now won’t fly at all this year. Little has been heard about Taranis since it was unveiled to journalists (and protestors) in July 2010. At the briefing journalists were allowed a distant peak at the drone as it sat in its hangar. The UK government gave BAE Systems £40m of funding to develop unmanned combat systems in January 2012. Perhaps surprisingly BAE told reporters that it was restarting its Mantis programme. Mantis is an armed medium altitude, long endurance (MALE) drone of similar size and shape to the Reaper. Unlike Reaper, however Mantis is not remotely controlled but flies autonomously following a pre-programmed flight plan. Mantis reached the end of its development phase when it flew for the first time at the Woomera test range in Australia in October 2009. Until now it has been suggested Mantis would simply form the basis of the proposed joint BAE-Dassault drone, Telemos. BAE also said it hoped it would sign contracts with the UK and French government to further develop the Telemos drone at the Farnborough airshow next month. Telemos is BAE and Dassault’s offering to fill the UK-French ‘requirement’ for a new armed drone. However the change of administration in France has created uncertainty about the proposal as the newly appointed French defence minister announced in May that he was going back to “square one” on the plan to build a joint military drone. Elsewhere BAE continues to undertake work to in order to allow unmanned aircraft to fly within UK airspace. As part of the ASTRAEA (Autonomous Systems Technology Related Airborne Evaluation & Assessment) programme, BAE will begin undertaking a series of test flights using a converted Jestream aircraft that can fly autonomously as an unmanned aircraft. At least twenty test flights will take place over the Irish sea over the next six months. BAE issued a glossy diagram to explain the work that they will be undertaking (large pdf here). The other main ‘British’ drone, Watchkeeper – which is being jointly developed by Israeli company Elbit Systems and Thales UK – seems to have missed out on being chosen by the French army as their new drone. As part of the Anglo-French defence treaty, France was supposed to consider Watchkeeper for the contract but it was announced this week that they have instead bought further Sperwer MKII drones from French company, Sagem. Given this new contract and the fact that France have announced they are withdrawing early from Afghanistan it is unlikely that the French will want Watchkeeper as well. For more info on Watchkeeper follow Wandering Raven’s blog and see this recent comprehensive article. Finally, I can’t finish a post about British drones without mentioning the Reaper. The Guardian reports this week that British reapers have now fired 281 weapons in Afghanistan up until the end of May 2012 and rightly points out that MoD continues to insist that only four civilians have been killed in these British drone strikes whilst at the same times maintaining that they cannot know how many people have been killed. In stark contrast to this suggestion, the MoD have written to me (letter here) saying they will no longer answer my Freedom of Information requests on the use of UAVs in Afghanistan “until at least the end of operations in Afghanistan.” Needless to say I have appealed (letter here) and will continue to demand more transparency and public accountability on the use of British drones.